With eBay Feeds tool you can search for targeted eBay products using your keywords or specific seller IDs. Search results will be combined into a self-updating content feed which will show all latest eBay listings related to your search. Your eBay affiliate ID can be automatically embedded into product links and images. You can right away start promoting eBay products and earn your fair commissions. eBay feeds are Private content feeds. 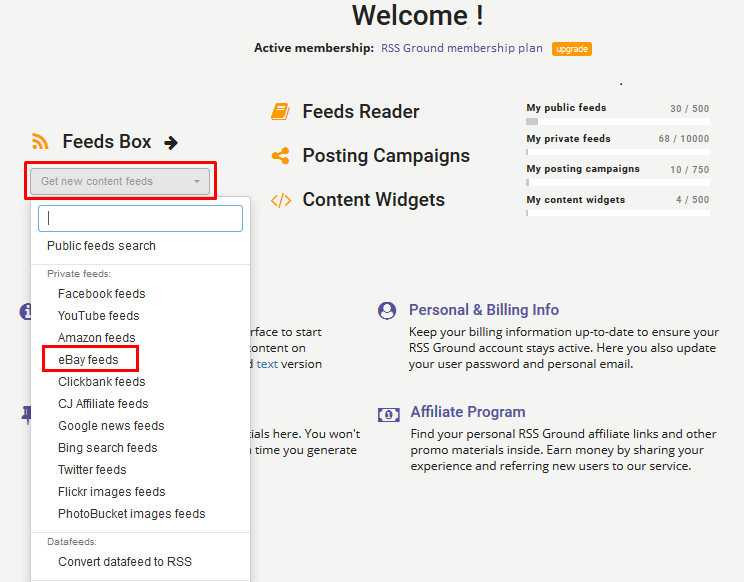 The number of active Private feeds may be a subject to limitations at RSS Ground membership plans. Before you start using eBay Feeds tool you need to sign up to eBay Partner Network - official eBay affiliate program. See quick guide. eBay Feeds tool has Basic and Advanced settings. Advanced settings are optional and are used for a specialized search. At the same time, basic settings are quite enough to search for targeted and quality eBay products. Choose if you wish to search for eBay products by keywords or by seller IDs. Specify your search keywords or seller IDs. Up to 10 search keywords or seller IDs at a time are allowed. Use Setup posting campaign option to start sharing content from eBay feeds right away. Whatever option you choose your new eBay feeds will be saved to your Feeds Box anyway. We will generate a separate eBay content feed for each specified search keyword or seller ID. 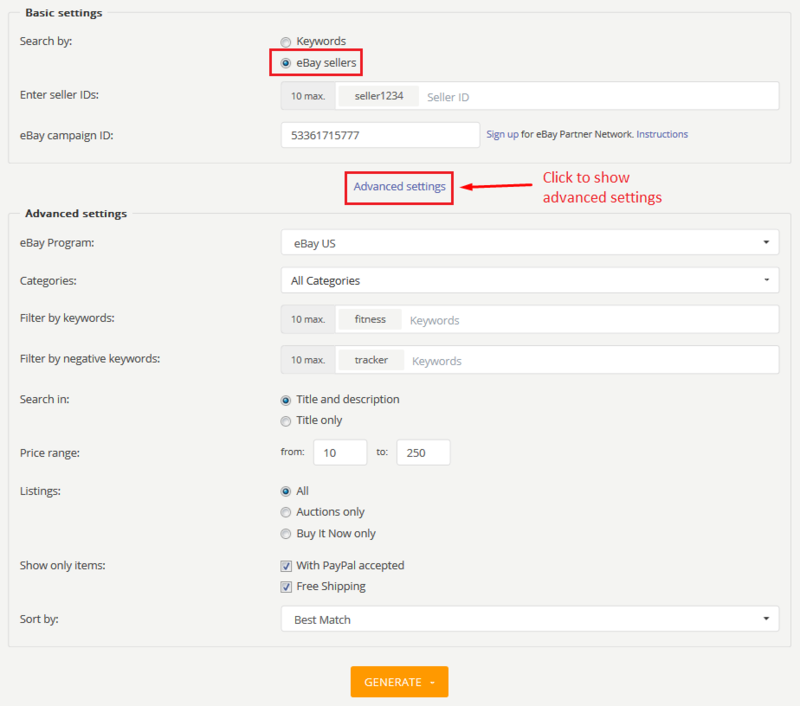 To search for targeted eBay products you can use only Basic settings. Advanced settings are optional. eBay regional program - used for a localized search. Learn more about eBay regional programs. eBay category - search for eBay products in a specific category. You can specify any eBay category using Custom category ID option. Learn how to look up a needed eBay category ID. Search in - you can for products by titles only, for more relevant search results. Exclude sellers - remove products from specified sellers from search results. You add seller IDs here. - Auction only - show only products that are sold through auction. - Buy it now (BIN) only - show only products that sold immediately at a fixed price. - Use All option to show all available products. Order conditions - limit search to products with free shipping and/or that use PayPal as a payment option. - Best match - show most relevant search results first. - Items ending first - show listings which expire soon first. - Newly listed items first - show recently listed products first. - Lowest price - show products with the lowest total price (price+shipping) first. - Highest price - show products with the highest total price (price+shipping) first. 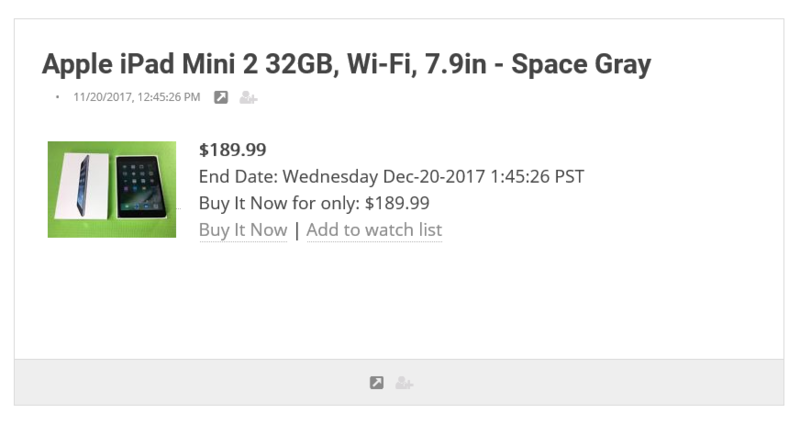 In Basic settings section, you set: Search by = eBay sellers. Enter eBay seller IDs (up to 10 at a time). Learn how to find eBay seller ID. 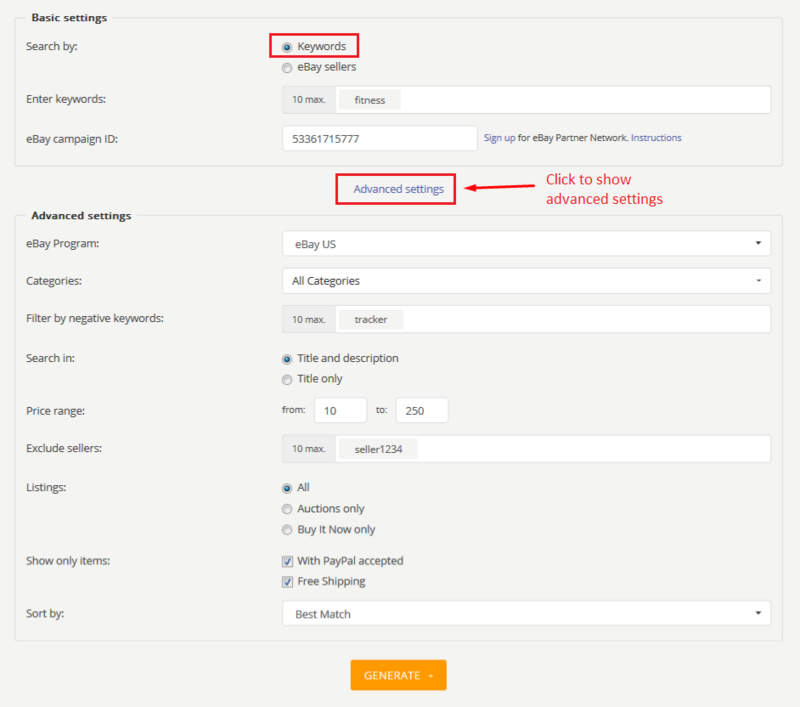 In Advanced settings section, you use one or several filters, the same as for keyword search. Filter by keywords - show only products which mention at least one of the specified keywords. Search in - you can search for products by titles only, for more relevant search results. - Lowest price - show products with lowest total price (price+shipping) first. - Highest price - show products with highest total price (price+shipping) first.